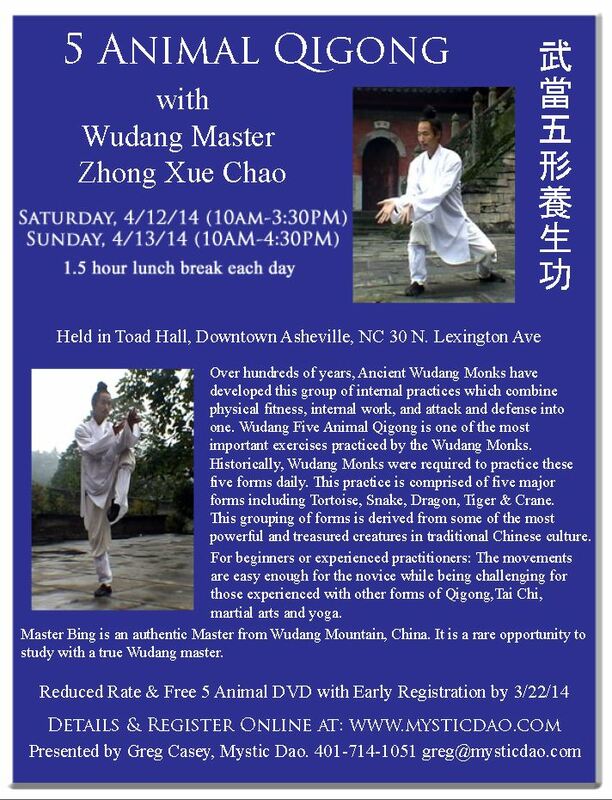 PDF 5 Animal Qigong Seminar at Asheville, NC April 12th & 13th,2014 Join Wudang Qigong Master Zhong Xuechao aka 'Master Bing' on his first trip to Asheville, NC to learn the Wudang 5 Animal Qigong forms. This style has been practiced by the Daoist Monks of the Wudang Mountains in China for hundreds of years to promote longevity as well as enhance practice of martial arts and spiritual cultivation. This weekend will be a rare opportunity to study each of the five animal forms with a true master to teach, guide and correct. Master Bing will teach each of the 5 animals including the Tortoise, Snake, Dragon, Crane and Tiger.